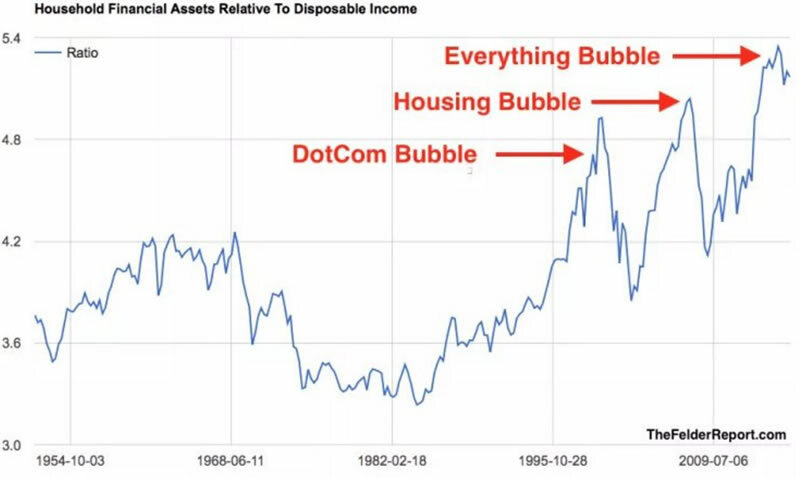 There are a lot of warnings on Bloomberg, CNBC and other financial media these days about a bubble in the stock market, particularly in FANG stocks and the tech sector. But former Fed Chair Alan Greenspan is not in agreement. He is continuing his message of the last two years, that there is a bond bubble and which is more dangerous than what is going on in the stock market. 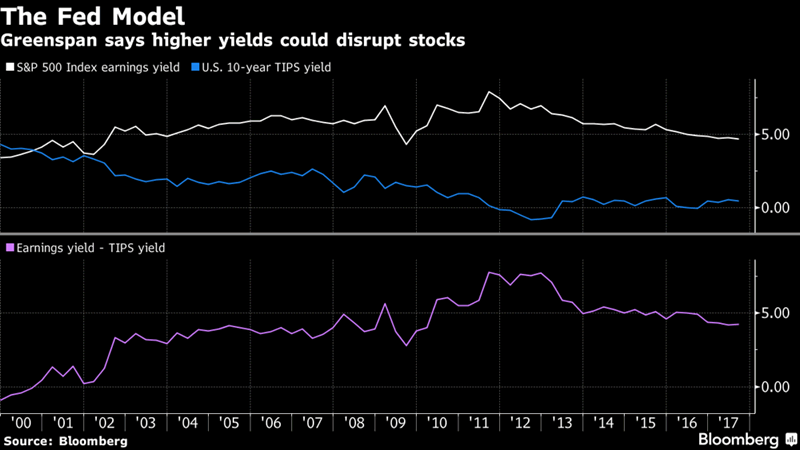 He is not the only one, in recent months there has been a growing number of those who are concerned that real bond yields in the U.S., UK, EU and elsewhere are well below where growth and inflation rates seem to suggest they should be. They correctly warn that it is only a matter of time before the inflationary pressures (that we are feeling) hit the bond market. Greenspan’s warning this week comes a little over a year after he last warned us that we were currently in the worst period he has seen since he began public service, including the financial crisis. At the time he pointed towards the problem of ‘entitlements’ (welfare / warfare spending of the ‘welfare warfare state’). Something, he argued, is uneconomic and unsustainable. The main reason for its lack of sustainability is the low growth rates developed countries around the world are experiencing (around 2%). Asset prices obviously include the bond market, and this is where Mr Greenspan believes we should focus our concerns. Thanks to the unsustainable levels of low interest rates. Something which he has expressed concern about before. “By any measure, real long-term interest rates are much too low and therefore unsustainable,” the former Federal Reserve chairman, 91, said in this latest interview. Two years ago Greenspan told Bloomberg that the bond market price-to-earnings ratio was in an ‘extraordinary position’ and that interest rates sitting below 4% was not normal. Yields on the US 10-year Treasury note have been below 4% since the summer of 2008 (see chart below). Currently around $1.5 trillion a year is created by central banks through money printing schemes. The major central banks (US Federal Reserve, the European Central Bank and the Bank of Japan) have collectively gathered around $13 trillion of government bonds on their balance sheets. All of them, including others such as the Bank of England, are signalling that times are changing. For as long as money is being printed then bond prices have been going up. Great news for investors and pension owners, but those same investors would like to be able get out quickly. 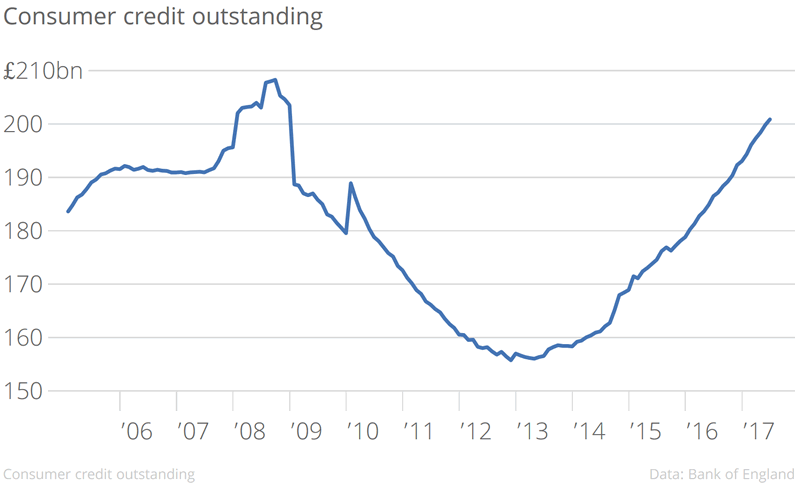 This has been possible in recent years, thanks to what is basically a globally co-ordinated scheme of massive currency creation and bond buying. However, we now appear to be heading into a period of co-ordinated global rate-hiking. This means that as interest rates start to climb then liquidity conditions will not work in investors’ favours. There is little reason why we will not see a domino effect of increased interest rates, heightened volatility, falling bond prices and then perhaps even a crash in the stock and bond markets. 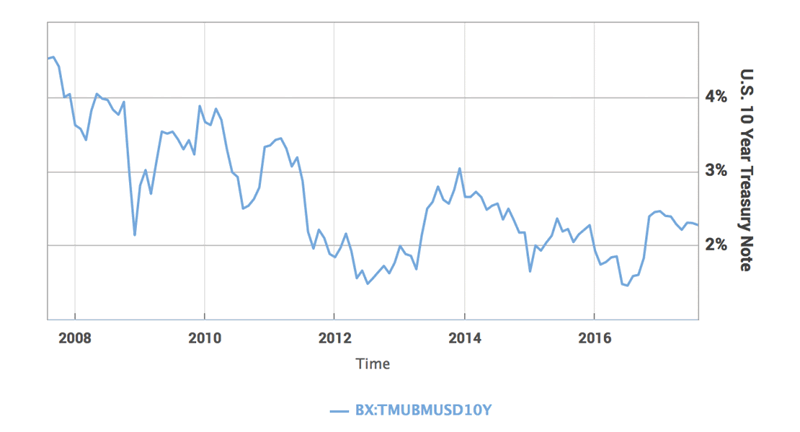 According to the 207 investment professionals surveyed by BAML last month, this would be disastrous for the market. They warned that a crash in the global bond market is the biggest tail risk for markets. But so far these warning cries are little heeded in the mutual fund and wider market. According to Morningstar retail and high net worth investors alike are still ploughing cash into bonds. Fixed-income products attracted $355bn in net new money between January to May 2017. Consider that next to the $375bn of net inflows for all of 2016. The figure also surpasses the entire year’s figures for 2013, 2014 and 2015. Some of those who are buying believe that as inflation rates are low then it is unlikely to be a cause for concern to central banks, who are then less likely to raise rates rapidly. 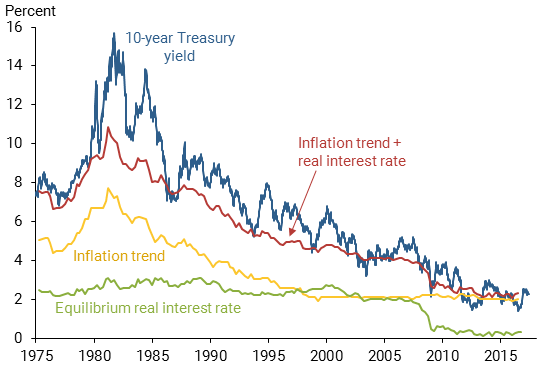 However, as we have covered here, the real rates of inflation really are a growing concern and are now on the radar of concerned central bankers. What does this mean for gold? Mr Greenspan is a well-known gold-bug. Just earlier this year he said in an interview that investors were diversifying into gold and silver due to the deepening lack of trust in the financial system and currency markets. Gold is not only insurance against inflationary pressures but it is insurance against the unknown whether that be the outlook for the dollar or for the survival of the euro itself which Greenspan warned about earlier this year. Earlier interviews with Greenspan have provided insight into how often bodies such as the Federal Reserve misjudge economic situations which then results in poor policy making. Of course, no one knows how the financial future will evolve, especially as each crisis comes with new financial strategies, technology and human behaviour. Greenspan is unable to predict when the bond bubble will burst, and many disagree that it will happen, instead pointing to a stock market problem. The bottom line is no one has a crystal ball. We simply don’t know now how this will pan out. But we do know that the current situation is unsustainable. Most asset markets look overvalued and the value of major currencies are slowly being eroded. Gold will hedge and insure against these real risks. This update can be found on the GoldCore blog here. Disclaimer: The information in this document has been obtained from sources, which we believe to be reliable. We cannot guarantee its accuracy or completeness. It does not constitute a solicitation for the purchase or sale of any investment. Any person acting on the information containd in this document does so at their own risk. Recommendations in this document may not be suitable for all investors. Individual circumstances should be considered before a decision to invest is taken. Investors should note the following: Past experience is not necessarily a guide to future performance. The value of investments may fall or rise against investors' interests. Income levels from investments may fluctuate. Changes in exchange rates may have an adverse effect on the value of, or income from, investments denominated in foreign currencies. GoldCore Limited, trading as GoldCore is a Multi-Agency Intermediary regulated by the Irish Financial Regulator.